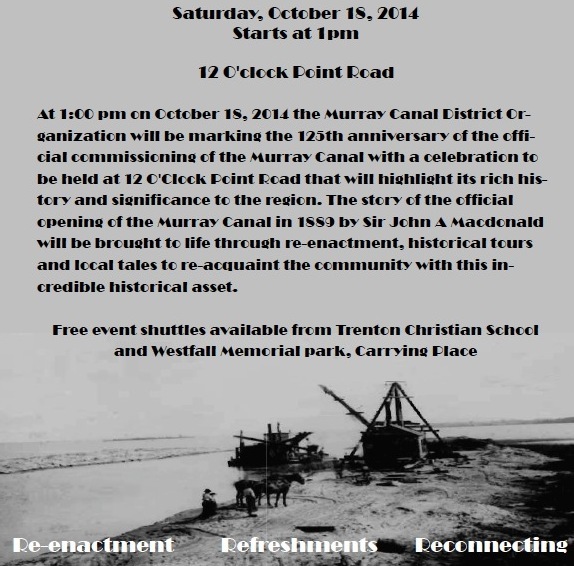 Join us on October 18th for the Murray Canal’s 125th Birthday Party! Festivities start at 1:00 PM sharp. Sir John and Lady Agnes Macdonald will be there, reminiscing about the opening. Re-enactments, refreshments, historic artifacts and much more! Just off the Highway 33 Bridge, North Side at Twelve O’clock Point. Rain or shine. Event tent provided. Parking with shuttle buses provided.